Hi, I am trying to get a shared experience to work correctly with 2 devices such that both users can tap a hologram and move it around the room. I launch the app on the device 2, and after a few seconds, it is able to get the world anchor from the device 1 and the starting hologram then moves to the same location as seen on the first device. 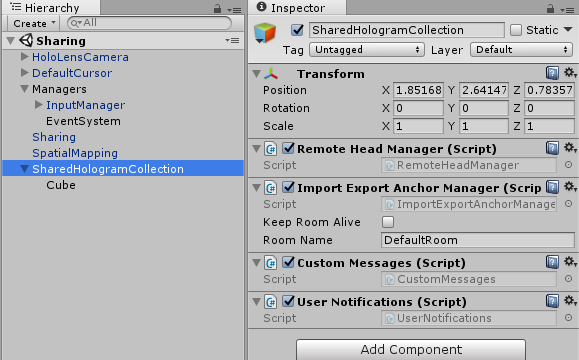 If I move the hologram from the device 1 (using a modified version of TapToPlace), the updated transform information is sent to the sharing service and the second device is able to download the updated transform position and rotation. If I move the hologram from the device 2, the two devices get out of sync and the world anchors stop getting updated. After moving a hologram from device 2, device 2 no longer gets an updated position when I move the hologram on device 1. Because a lot of this code is event driven and there are multiple update loops running checking state and whatnot it makes it difficult to trace visually and debug. I am aware that there is the holograms 240 course, which I am familiar with, but I want to get a sample working using the actual holotoolkit and not the version that is used in that course. Has anyone else run into this sort of scenario or is there something I am missing here? I know this is an old post but were you able to solve this? I'm running into a similar error.